Protect their intellectual property from the start. Recognize the value of setting up a business for a local and global reach. Thorough discussion on trademarking, copyrighting, patenting, licensing, merchandising, as well as franchising. Inside information on aspects that every entrepreneur needs to know and take into consideration in order to retain control of the situation without having to hand everything off to an attorney or other professional. Provide an inventor with a comfortable game plan that he/she can use in order to prepare for a patent filing. We teach the new inventor to thoroughly familiarize oneself with the chronology of the patent process, the trademark process and the licensing process simultaneously. We take a slow but steady approach. We also start the branding process right away and we alert the inventor to protect the necessary intellectual property and domain names. We place the inventor in the position of having a comfortable working vocabulary and understanding on many fronts before they go to an attorney. I want the inventor to have the confidence of being able to make decisions, and take part in the overall discussion process based on their knowledge of the entire picture as it relates to patent, licensing and branding issues. What is the life time value of knowing how to author a book and build an industry around it? It is quite a valuable skill to have no doubt. Create a thorough outline for your book. It will be worth a lot more if it is information packed rather than just general. Author a book from scratch and create an entire industry from the book whether it is a fiction or informational type book. Assess the book for intellectual property. Leverage your intellectual property for merchandising and licensing agreements. Publish your book to four major publishers. We also cover streaming video, audio and a number of other ways to monetize the material covered in the book whether it be fiction or non-fiction. I go over in detail a multitude of ideas to put into action for your book that will lead you to creating a multi-faceted business based off of nothing more than the Original book. Grab a copy today on Kindle, Nook or Kobo. All have free readers for your desktop, laptop or smart phone. This book attempts to examine a number of scenarios that surface in companies large and small on a constant basis but may not be realized on a conscious level. When we examine a company looking in from the outside, I am going to outline exactly how I would go about correcting the highlighted scenario and suggest a remedy. This particular book is about how I see things and how I would go about implementing policy and procedure for the better. 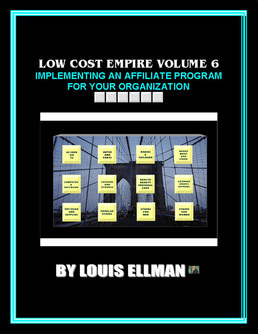 The scenarios that I present in this book are valuable for both a small business and/or a large corporation. Whether you run or work in a small business or you run or work in a large corporation this book will be of value to you. There is also valuable strategy concerning day to day operations and strategy as to how to best position yourself to ensure you are constantly moving in a forward direction and fully alert of your surroundings. 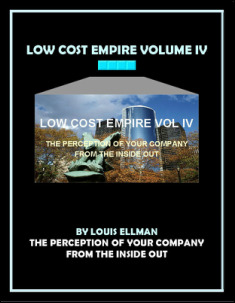 This book will be a great learning experience as well as a necessary expanding of your awareness as it relates to properly positioning a company before looking for money for your venture. We will go through a number of essential items that will greatly help you to create a solid presence for your company well before you start doing your pitch. We will cover everything from creating a presence, to protecting your concept to raising your own money, to test marketing and preparing for your meetings in front of potential backers. Most important, it is all possible to achieve and I am going to show you how. 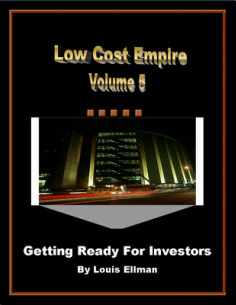 No matter what kind of business you are developing you must read this book before your quest for financial backing. You will be glad you did! This book will give any organization with a loyal following, the ability to implement a full scale mini mall affiliate program in order to position themselves to make residual income all year long based on the normal shopping habits of their loyal organizational members. I will take you by the hand and totally familiarize you with all aspects of what an affiliate program is about, how to sign up and utilize all of the major affiliate brokers and strategy involved whether you are using website development software or free template software. You will truly learn how to implement a very powerful but extremely underutilized money raising tool for your church, animal shelter, sports team or club or charity. This book is perfect for those people who wish to self publish their own book(s) to multiple self publishing companies. 6) I supply you with an amazing amount of material whereby you can do this for yourself or other at any time. 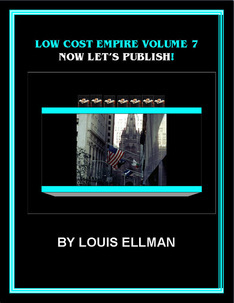 You truly will gain a new vocation from the information contained in Low Cost Empire Volume 7. 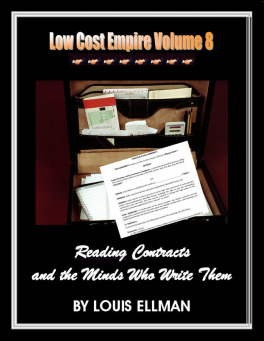 This is an important and unique book for those of you who need to enter into a contract of any type. It could be a Fee Agreement, a Lease, a Licensing Agreement, a Loan, a Non Disclosure Agreement and so on. The point being, that if you have to enter into a contract, there are things that you need to be alerted to so that you just don't do a cursory read of the contract. What has been left out in order to place you at a distinct disadvantage. By the end of this book, you are going to be at the very least much more comfortable with the concept of reading, modifying and understanding contracts. This book will give you commentary on a number of contracts, strategy and the ability to work on a high level in a very short period of time. Your working vocabulary will increase and each new contract that we go over will become that much easier to absorb and understand. This is all about exposure and more important, exposure to terminology and visual examples concerning contracts. 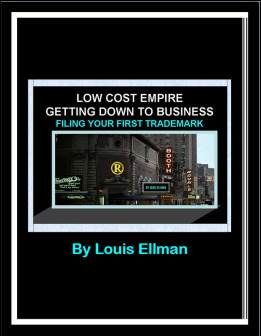 In this book I share every tip, trick and method I use in filing for Trademark protection. I hold your hand the entire way and you learn a valuable skill you can then do for yourself and others. I have put together this book so it is structured like a college course that you can work through at your own comfortable pace. This book is for beginners who want to learn everything from beginning to end how to prepare for and file a US Trademark. Learn how to do a thorough search for availability. Learning why they are so valuable and vital to your overall success. Learning all of the individual pieces of the database. Learning how to use the TSDR section of the database to your advantage. Drafting of the goods/services description section. Filing the actual mark step by step. Dealing with 6 of the most common office actions. When you are done reading this book you will know how to comfortably navigate around the subject of Trademarks. All have free readers for download to your PC or Laptop. 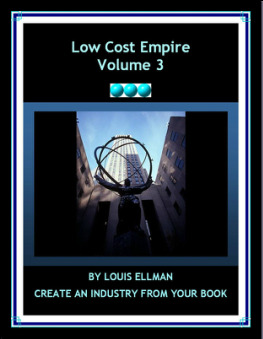 Low Cost Empire Mini Series Volume 1. The 3 Step Essential Process When Creating and Naming Your New Business. The 3 Step Essential Process When Creating a New Business will serve you well each time you come up with a great concept name. 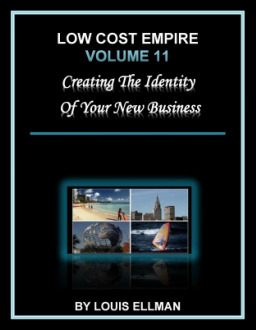 This booklet will assist you in knowing the routine to follow for each new venture and will give you the confidence you need in knowing that your proposed name is indeed unique and available. 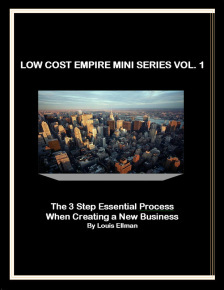 For those of you that need to know what comes after the Initial 3 Step Process you can purchase Low Cost Empire Vol 1 an Entrepreneurial Textbook. 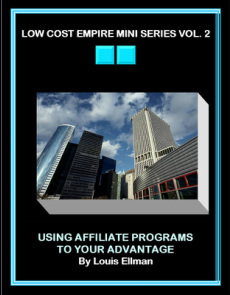 This book is a must if you do not have a comfortable working knowledge of using affiliate programs to your full advantage. We examine how they work and how to implement them from the perspective of the advertiser and from the perspective of the website owner who takes full advantage of these programs. I also advise you how to use your loyal following in order to make year round income from affiliates. By loyal following, we are referring to your school, your Church, your business...just use your imagination. This book will step by step take you through the thinking process about how to create and protect your identity each time you start a new venture. While you read this book you will be able to take action right away. There is no way I would ever start a new venture without going through the considerations of this book like a checklist. 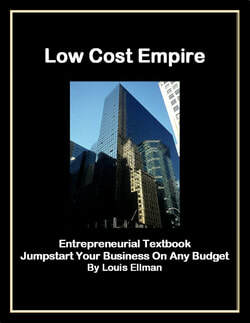 I have authored this book for people that want to start a business and be in a position to immediately compete. Not doing the things that are carefully discussed in this book will place you at a distinct disadvantage. You can bet that any business that operates on a high level will be doing the procedures, considerations and preparations that we discuss in this book. The days of just opening up are gone. You now have to simultaneously develop your local and global presence and I am going to hand hold you through this process. 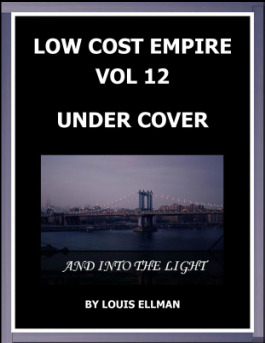 The Under Cover aspect has to do with going about the set-up of your new entity and identity in stealth mode until everything is in place before you go “Into the light”. If others know what you are doing there are many who will be glad to derail you before you even get started. You must have everything in place having to do with your business identity. The overwhelming majority of information I will supply you with will be available to you for a minimal amount and in most cases for free. We will examine numerous areas that should be considered and you will be able to make decisions and take immediate action while you are reading this book. When it comes to business, knowledge is a form of currency that can be put to use in order to make money. I am going to truly unload in this book. The goal is to give you amazing insight and advantage over others in your same line of business. It does not matter what you do in your line of business. These considerations need to be examined across the board. Post that very article on most of the major social media outlets in about a 10 minutes period. Your article will be available on the main Social Media outlets and will be seen by thousands of people. Produce a Constant Stream of interesting marketing content while simultaneously pushing your goods and services to this world wide audience. We go step by step, social media site by site where I discuss specific strategies for each of these separate social media entities so you get the most out of each one. Provide value in your articles, gain recognition as to your knowledge in your field and have others get a good feel of what they will experience if they are to purchase your service or product. In essence, you are helping to develop your brand. By the end of this book, be very comfortable posting an article AT ANY TIME using nothing more than your phone or tablet. This routine will also alert the reader of your articles as to the products or services you have to offer as well as the valuable content you provide. A number of contracts that are FULLY explained as to how they protect you and what you need to know in terms of vital language in each type of contract. Back and forth conversations showing how the two sides strategically deal with each other for the upper hand. Learning the darker side of how people attempt to bypass you in order to avoid payment of commission and strategies to counter these attempts. Introducing inventions, artistic endeavors, book concepts, movie concepts, disruptive business concepts properly, so that you retain full control of your concept and ultimately profit from your idea. Ability to contact the author for questions and additional help! To show you a method that will allow you to write short but valuable articles pertaining to the line of work you are in, the business sector you are in and at the end of those articles, you will be placing links to the products and services that you offer. I will also extensively go over putting together commercials pertaining to your goods and services. There are so many ways to say the same thing so I will show you how to keep your material sounding fresh so that you are in a position to keep interest as to what you are offering. In conjunction with my book Social Media Marketing On the Go, you now will have an entire methodry in terms of writing the articles that draw attention and then quickly being able to post them to all of the major Social Media Sites.. I am about to unfold in this book a very simple method that will enable you to produce quality articles and material on a perpetual basis. You will be able to build up a library of articles that YOU have authored as well as those which you have come across which can be used over and over again in different media venues. People will get a good feel of who you are and what they will experience if they are to purchase your service or product. In essence, you are helping to develop your personal brand. Bring to your attention many aspects of marketing that seem to go by the wayside and not ever considered. This book will ramp up your awareness level in terms of television, radio and internet and social media related ad content and different angles. Why certain approaches in certain venues will not work as well as other approaches. Improve your ad copy and improve your variation. Learn new concepts that help you to tailor your ad campaigns and add intellectual property value to the company overall. Whether you are working within a marketing firm or you are working on your own and wearing many hats, this book is going to be of great help to you! Trust me, if these methods were in the forefront of your mind you would be surely using some of them! Mini Trademark and Patent lesson. A full blown Business Plan routine to follow with full explanation. The Executive Summary with full explanation. Your Elevator Pitch with full explanation.. Your 12/20 slide show with full explanation and sample slide show for each slide. You are about to learn a TON as it relates to putting together your business package. No one will better know what you wish to accomplish better than you. No one can represent your idea with the same passion and sincerity as you. The results will be that the package reflects your personality and reflects your vision. You will save a lot of money. If you have no fear in writing your own material, then you will really appreciate this book. You will also learn a lot of new vocabulary and many concepts. As with many other books I have authored this book is teacher connected which means you can contact me.